Uplifting, refreshing and antiseptic. Citronella is a grass that is native to Sri Lanka, and now a few dedicated farmers have been awarded Organic Certification for this essential from ECOCERT. Two closely related species of citronella grass are used to produce citronella essential oil; Cymbopogon nardus which is known in the oil industry as ‘Ceylon type’, and Cymbopogon winterianus known as ‘Java type’. Quinessence organic Citronella essential oil is obtained by steam distillation of the aromatic grass from Cymbopogon winterianus and it has a long-lasting, fresh citrus aroma. 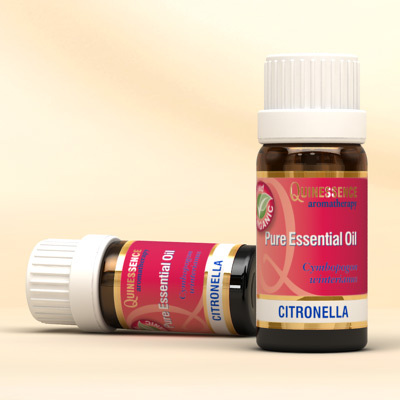 Citronella essential oil is known to be a strong inhibitor of Streptococcus pneumoniae, which apart from being responsible for pneumonia also causes meningitis, septic arthritis, peritonitis, osteomyelitis and brain abscesses. Similarly, it is quite effective in inhibiting a wide range of human pathogenic fungi, including Candida albicans, Aspergillus niger, Sporothrix schenckii and M. gypseum. This antibacterial and antiviral action makes citronella oil extremely useful in treating colds, flu and other bacterial infections.